LIBERTY CALL is an accomplished blue water cruiser built to a very high standard by the well respected Swedish yard. LIBERTY CALL exhibits an outstanding combination of beautiful Scandinavian craftsmanship and proven design characteristics from German Frers. 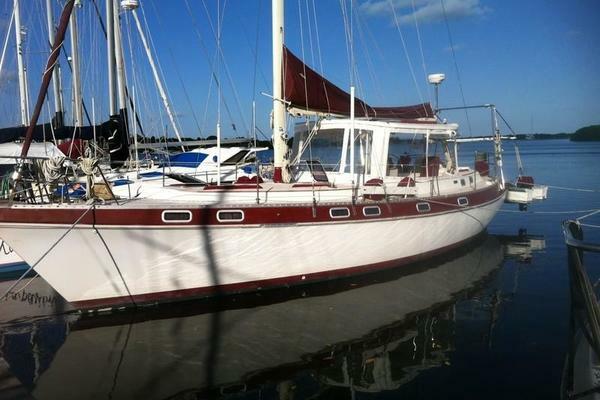 She is extremely well equipped and has just completed a double Trans Atlantic from Charleston, SC to Las Palmas and back. Recent Mast/Rig, Sails and Boat Surveys available. LIBERTY CALL has been meticulously maintained by her very knowledgeable owner... she is in fantastic condition and ready to go in a moments notice. If you are looking for great value in a great sea going boat give me a call to setup an appointment! Liberty Call sleeps six in two private staterooms, plus two in the main salon. Her interior is finely furnished in light mahogany with a satin varnish. Cabin soles are varnished teak and holly with removable carpet covers; overheads are fabric panels with mahogany strips. Interior decor includes Ultrasuede upholstery and throw pillows. The forward guest cabin features a v berth with 7' long berths and a filler to convert to a double. There is a large dresser, hanging locker and several other storage lockers. There a completely private head and separate stall shower. The main salon includes an L-shaped settee to port, full-length settee to starboard and large drop-leaf table with storage on center line to accommodate six with ease. Generous storage can be found outboard on each side. The nav station aft to port provides a comfortable forward facing chart table, full instrumentation, lots of storage and easy access to the electrical panel. Walking further aft toward the owners cabin, one finds more storage space, a hanging locker and a large engine room access door inboards. The large owner's cabin features a double berth to starboard, single berth to port and seat on center. There are numerous lockers, shelves and a hanging locker and mirror. A Raymarine ST60 Multi-function is within easy view of the berth. A private head with separate stall shower is to starboard.